The Steyr AUG made its way stateside with the civilian A3 variant, which definitely raised more interest in the bullpup rifle within the United States. Now Magpul is announcing they have developed a 30 round PMAG for the Australian Military including a round count view window. It will be available in the U.S. and abroad. We have provided their full announcement below. Announcing the PMAG 30 AUS GEN M3 Windowed Mag for the Steyr AUG/F88/F90. Developed for the Australian Military, Shipping Fall 2014 for U.S. and international sales. 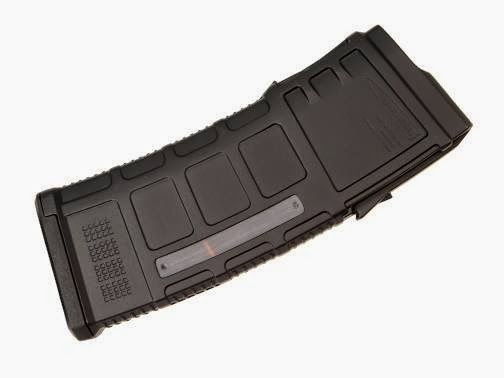 The PMAG 30 AUS GEN M3 Window is a 30-round 5.56x45 NATO polymer magazine for Steyr AUG/F88/F90 compatible weapons that features transparent windows to allow rapid visual identification of approximate number of rounds remaining. Similar to the GEN M3 PMAG for the AR15/M4, the PMAG 30 AUS features a long-life USGI-spec stainless steel spring, four-way anti-tilt follower and constant-curve internal geometry for reliable feeding, and simple tool-less disassembly to ease cleaning. In addition, low profile ribs and aggressive front and rear texture gives positive control of the GEN M3 in all environments, and a paint pen dot matrix has been added to the bottom panel of the body to allow easy marking by the end user for identification. An easy to disassemble flared floorplate aids extraction and handling of the magazine and is slimmer than factory Steyr floorplates for better fit in tight double and triple magazine pouches. Durable, dual-side transparent windows allow for quick determination of approximate number of rounds remaining in the magazine. Utilizing a high visibility indicator coil on the spring and numerical markers on the magazine body, the MagLevel™ system provides positive verification with the added benefit over translucent magazines of displaying round-count even when the cartridge stack is obscured within the magwell.